Experience Signature Camping! Spacious tents, deluxe comfort, amazing meals and more! Arrive at Kilimanjaro International Airport where you are met after passing through customs. Transfer to Meru View Lodge and have a comprehensive briefing and equipment check with your climbing manager and your guide. Overnight at Meru View Lodge. Acclimatize during a day at Arusha National Park the foothills of Mount Meru ( Second highest peak in Tanzania ). Spot wildlife on foot as you warm up for your climb accompanied by an armed ranger. After breakfast in your hotel you will be given an overall briefing from your guide. At 9am you will be met by our staff, who will drive you several hours to the Western side of Mt. Kilimanjaro and to the Londrossi Gate, where our guides and porters will prepare and pack the equipment and supplies Once at the gate you will be given a packed lunch and after registration with the Kilimanjaro Park office, we will drive for another 45mins to Lemosho Glades where your trek will begin with ascending into the rainforest. You will ascend for approx. 3 hours in dense rain forest which could be very wet and muddy so be ready with your gaiters and trekking poles. During the trek we will have a break and you can enjoy the rest your packed lunch. We will reach the Mti Mkubwa Camp also known as ‘Big Tree’ Camp in late afternoon. After arrival, you will be taken to your camp and tent which has already been set up by the porters who ran ahead, where you will be greeted with boiled drinking water and hot washing water. Once you have freshened up and settled in, a hot dinner will be served in the mess-tent. From the forested slopes of Lemosho you ascend through a podocarpus and juniper forest and then break out on to a zone of heather and lichen-draped volcanic rock and the Shira Plateau, which used to be Kilimanjaro’s third peak before it collapsed. Lunch is taken on the trail and you arrive in camp mid-afternoon. 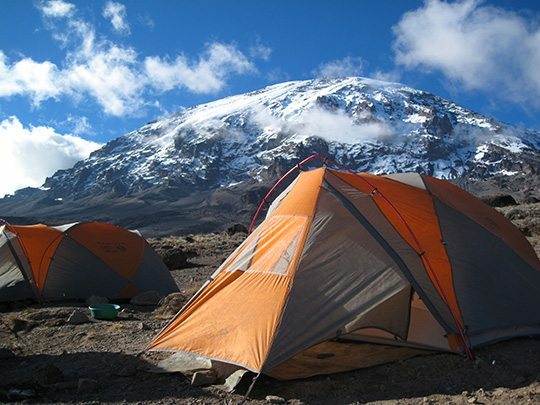 The view of Kibo (the peak of Kilimanjaro) is breathtaking from this vantage point. Overnight at Shira 1 Camp. After breakfast you will continue on your hike across and up the Shira plateau to Shira Camp 2 at 3,850 meters. Here you will join trekkers from the Machame Route whilst enjoying stunning view across the valley below and Western Breach of Kilimanjaro above. The plateau is exposed so be prepared for a cold night with temperatures getting below zero. We leave the forest behind now and a gentle grade walk takes you across the high altitude Shira Caldera to Shira Cave with fabulous views of Arrow glacier. We will camp here for the night at 4200m. We climb out of the Moir Valley and take a short detour to reach the summit of Lent Hills (15,400ft). After admiring the views we return to the trail and head eastwards around the northern circuit trail. The final section of today’s walk undulates until reaching the location of Pofu Camp. From Pofu Camp we cross numerous small valleys as the trail continues eastwards through a landscape that has increasingly sparse vegetation to eventually reach Third Cave Camp.. There is a steady ascent to reach the saddle, a lunar landscape between the peaks of Kibo and Mawenzi. From here we continue upwards and reach School Hut in the early afternoon. The remainder of the afternoon is spent resting and preparing for the summit day. Once again you will be woken for your final celebratory breakfast where our team will thank and congratulate you in their unique, special way! We will then set off for the final 3 hour scenic descent to Mweka Gate. After lunch you will dropped off at the hotel where you can relax under a long, well deserved hot shower. If your time in Africa ends today our transfer team will drive you back to Kilimanjaro International Airport (JRO) for your departure. If you have booked with us a safari or a few days to dissolve into the pristine sandy beaches and tropical waters of Zanzibar, we will be there to help you comfortably transition from your climb into your next Tanzanian adventure. NGARE SERO MOUNTAIN LODGE, ARUSHA Set in lush gardens amid forest and crystal clear waters on the slopes of Mount Meru, It offers 14 rooms, and has been providing personal service since 1974. Rooms have king-size beds or twin beds, and a bathroom with a tub for soaking after your trek. Also you can book a massage to ease your aching limbs after your climb. The Lodge is located only 30 minutes away from Kilimanjaro International Airport and Arusha town center. Camp in comfort in customized all-weather tents with upgraded zippers, flysheets, and closed-cell full-ground pads. Private toilet tents and solar-lit dining tents are provided daily. Hot meals are prepared from fresh ingredients by the camp’s chef. In the afternoons, hot drinks and snacks are provided. Can’t find a date that works for you? Contact us to set up a trek with dates that work for you! Tips Personal spending monies for souvenirs etc. As of July 1, 2016, Tanzania imposed a new Value Added Tax (VAT) on tourism activities. Welcome! Arrive at Ndarakwai Ranch, a favorite destination among our guests. Get acclimatized and prepare your body for Kili with guided wildlife walks. Spend a day viewing wildlife at Ndarakwai. More than 350 bird species and 65 mammal species can be seen on the ranch, thanks to decades of conservation work. Take in the serenity of Ndarakwai and rest up for your first trekking day. In the morning, you’ll begin your life-changing journey. And so it begins! Start your trek in the rainforest under a tangled canopy of moss-coated vines. Refuel and get your first taste of Thomson’s mountain cuisine with an outdoor meal just off the trail. As you make your way through the forest, keep an eye out for monkeys and exotic birds in the tree branches. Settle in at your first camp, nestled in verdant forest. Fall asleep to the soothing sounds of Kilimanjaro. They were an awesome team. I couldn’t have asked for a better trip.